The arrival of Cromwell in Ireland in 1649 marked the end of a relatively stable period of Irish history. Viking and Norman invasions had been absorbed by the resilient Irish, but Cromwell did leave an indelible imprint on the country. 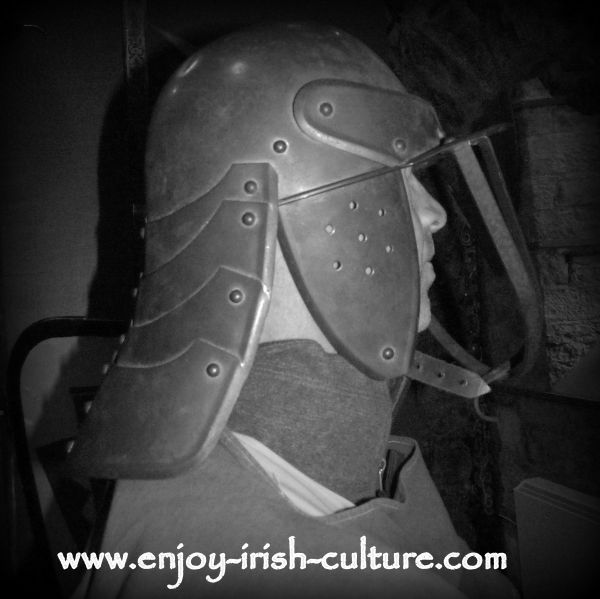 Cromwell in Ireland- replica of a Cromwellian helmet. A replica Cromwellian helmet that we tried on at the Athenry Heritage Centre. Four years after Cromwell's arrival, a quarter of the Irish population was dead. Catholic landlords were dispossessed, and some 7,000 Cromwellian soldiers were given large tracts of these lands in payment for their services. This group would form a new ascendancy, a very rich and powerful new elite who went on to build many of the Irish big houses and to shape Ireland's history in new ways, making the country a colony of England. What the Cromwellian conquest of Ireland boiled down to overall was the largest land grab in Ireland's history as well as in early European history. Before Cromwell, 70 percent of Irish lands were in Irish, Catholic hands. With Cromwell in Ireland, this was reduced to 10 percent. Irish landowners around the country were dispossessed and forced to move to Connacht, the Westernmost province with mostly barren land, where they were allocated a mere ten percent of the amount of land they had owned elsewhere. 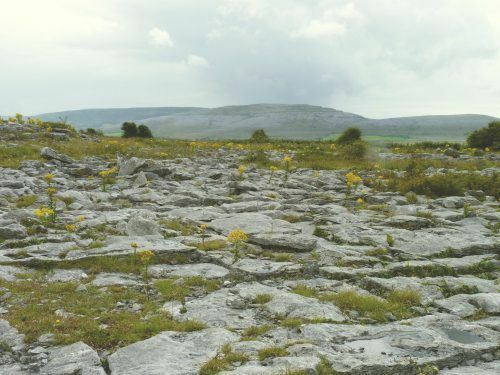 On the landscape photo below you can see an extreme of such a landscape in the Burren, in County Clare. You can imagine, I am sure, that not much can be grown there. Cromwell in Ireland- Barren lands in the west of Ireland all Catholic landowners were 'transplanted' to under the Cromwellian motto: "To hell or to Connacht." Religion or no religion, in the end the facts were that before the invasion, the English government coffers were empty. Soldiers had to be paid, and loans were due. Nevertheless, the religious element of Protestant against Catholic added a whole lot of extra charge and frenzy. It helped to motivate soldiers, and to justify the cause. The invasion was dressed up also as revenge for the 1641 rebellion when Irish peasants across the country had risen against English settlers and killed an estimated 4,000 people. This figure was hugely exaggerated in reports in England to as many as 100,000 which helped to instill hatred against Catholics. Read here about the residences built by the new ascendancy, those installed by Cromwell- The era of the Irish Big House. Did you know that the Cromwellian conquest of Ireland resulted in Irish slavery? Get the full picture here. The Catholic Irish were viewed, not as fellow Christians but as somewhat less than human. If a Catholic died, that didn’t really matter. People were even awarded prestigious rewards for killing Catholics, such as the Captain of a ship which captured a boat of 72 Irish on their way to England. He had them tied back to back and cast overboard. This earned him the reward of a gold coin by the English Parliament. It was in this climate that the atrocities against the Irish took place, such as those committed when Wexford and Drogheda were invaded. In Wexford, Crowells’ soldiers killed soldiers and civilians indiscriminately, it has been estimated that 3,000 people died on that day. In Drogheda, there was no mercy for 2,500 soldiers and 260 officers who had been promised quarter if they surrendered. All of them were executed once the town was captured. 1,000 civilians who had sought refuge in a church were killed when Cromwell ordered the church be set on fire. These atrocities are well known, and are quoted frequently in history books and documentaries about the period. They were unequalled in scale at the time and left a deep imprint on the Irish collective memory. A lesser known fact is that Cromwell sold many Irish into slavery. At some stage, the policy changed from simply killing the enemy to making money out of them first. Medieval Ireland's history and culture changed forever on the 2nd July 1653, the day the English Parliament made the decision to clear Catholic Irish landowners off their land. Catholic Irish landowners were transplanted to Connacht, the poorest province with often barren land while the richest and most fertile provinces of Munster, Leinster and Ulster were planted with English settlers. Among the settlers were 7,000 soldiers who received land as payment for their service. The order to the Irish was: Transplant or be hanged. The deadline given was May 1st 1653. Everyone had to reach the allocation station at Loughrea by the given date or be hanged. There were many executions of people who refused to move. Many didn't make it through the long trek which they had to take mostly on foot in the middle of winter. It is estimated that as many died on the march, as did in the war. Neither sickness nor old age were accepted as reasons for exemption. Widows and orphans alike had to transplant and accept 10 percent of the amount of land they had owned before. Some were sent on the march without being allowed to bring supplies, (as a punishment) having to rely on charity. Interestingly, the English moved the landowners, but the peasantry was allowed to stay behind. Why? They needed the labor to work the land. With the clergy and gentry gone, it was hoped that the Catholic peasants would convert to Protestantism. With the peasantry staying behind, the gentry should be forced to become laborers themselves, or to die if they didn’t. Put into modern terminology, Cromwells’ combined strategies of killings, selling Irish people into slavery and transplantations were a full scale ethnic cleansing of Ireland. If you would like to find out more, there is an excellent book on this period of Ireland's history which we have used a resource for all the facts and figures quoted here: To Hell or Barbados by Sean O Callaghan. 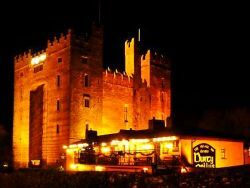 Hi there, if you enjoyed this article on Ireland history and like what we do on Enjoy Irish Culture, please pay it back and help us grow our readership by using any of the social features we provide on this website, the social buttons top left, the comment box below or the social sharing options at the very bottom.